Aspirin is always the glaring drug on the list. While many women fully expect to see prescription medications on the list, aspirin never fails to shock many. Taking this or even Ibuprofen during pregnancy could be lethal to the baby because a baby might not get the oxygen it needs by blood from the placenta. Ibuprofen and aspirin could severely limit or block the flow needed to provide the baby with proper oxygen levels. Common examples include Advil, Excedrin, Bayer, Motrin and their generic forms. Though not necessarily a drug, vitamins are a staple of a healthy life for many. But a variety of vitamins can have adverse effects on a baby during pregnancy. Vitamin A, D, E, and K, for example, have been linked to issues with fetal development. In its most extreme form, these vitamins could lead to jaundice, heart problems, and more. It should be noted that these risks can occur simply by taking supplements and not drawing the vitamins exclusively from food. This could mean popular multivitamins and even independent vitamins. 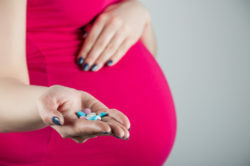 Pregnant women living with depression and anxiety can take any number of popular brand name medications for their condition. But what they may not know is that many antidepressants have been linked to severe birth defects and injuries. Injuries linked include but are not limited to abdominal birth defects, cleft lip, cleft palate, hearts defects, limb deformities, autism, and much more. Skin acne is extremely common during pregnancy due to hormonal imbalances. Be it a new or pre-existing condition, it can be tempting for a pregnant woman to take acne medication to reduce or eliminate acne. However, acne medication has been linked to facial deformities, heart defects, brain issues and more. Popular brands would be Accutane, Retin-A and their generic forms. There have been cases in which the mother did not know that the drugs she takes could adversely affect both her health and the well being of their child. They continue to take these drugs considering the absence of any kind of warning and learn only about the dangers when it’s too late. It’s important to not that pregnant women should always consult their doctor before starting, stopping, or continuing medication while pregnant. If you or a loved one has experienced adverse health issues or has had a child that has experienced birth defects, contact a personal injury lawyer who could help. Contact the law offices of Richard Stoloff today to schedule your initial case consultation. You could be eligible for compensation related to you and your child’s injuries.